Plants dark purplish to greenish-black, lax and slippery, pinnately to irregularly branched, usually with prolific shorter branches on proximal axes, up to 30 cm long but usually shorter, several axes borne on a common discoid holdfast. Axes complanate, 2-15 (-20) mm wide and 200-500 µm thick, surface proliferations common in middle parts of thallus. Medulla of loose filaments, with stellate cells in sub-cortical layer; cortex of anticlinal rows of 4-5 cells, outer cells 2-3 µm wide and up to 10 µm long. Reproductive structures produced all over thallus except in basal area. Tetrasporangia immersed in cortex, elongate, cruciately divided, ca. 15 x 35 µm. 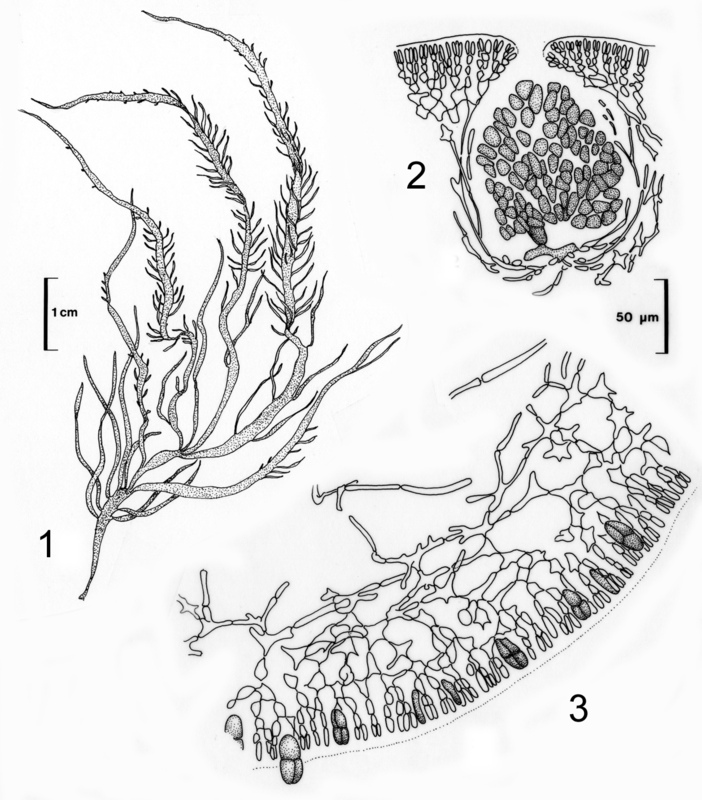 Gametophytes dioecious; cystocarps globose with prominent ostiole, immersed in thallus, spermatangia not seen. Recorded from Namibia, along the whole west coast and as far east as Port Alfred (1-39). West coast specimens are often notably longer and broader than those from the south coast, which are usually 5-10 cm long and only a few mm wide. Occurring frequently in rock pools, usually in the mid-upper eulittoral zones. Type locality: Kommetjie, Western Cape Province (De Clerck et al. 2005). Note: Previously known as Grateloupia filicina, a species that was considered to be cosmopolitan, until G. filicina was shown by De Clerck et al. (2005) to be limited to the Mediterranean. Grateloupia capensis, De Hoop (BOL). Scale divisions in cm. Grateloupia capensis. 1. Habit. 2. Carposporohyte in cross section of thallus. 3. Section with tetrasporangia. Reproduced from Stegenga et al. 1997 (as G. filicina). De Clerck, O., Gavio, B., Fredericq, S., Bárbara, I. & Coppejans, E. 2005b. 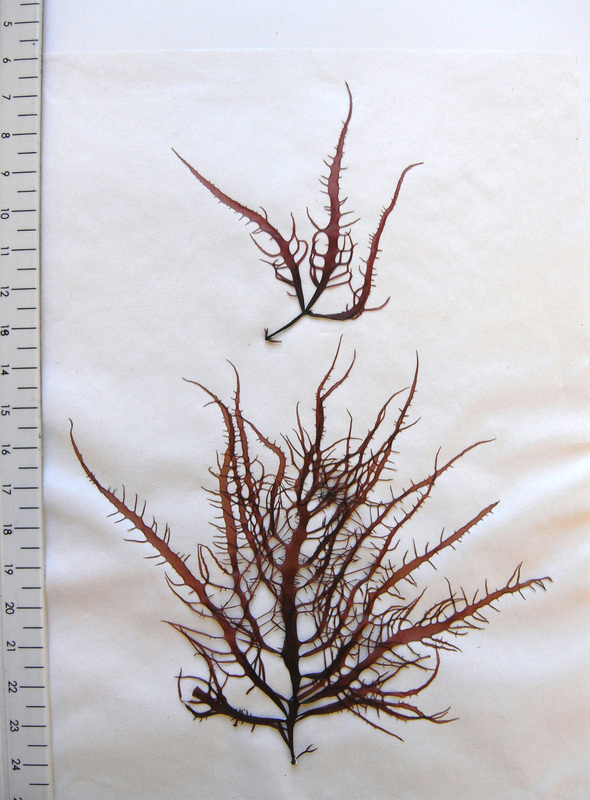 Systematics of Grateloupia filicina (Halymeniaceae, Rhodophyta) based on rbcl sequence analyses and morphological evidence, including the reinstatement of G. minima and the description of G. capensis sp. nov. Journal of Phycology 41: 391-410.